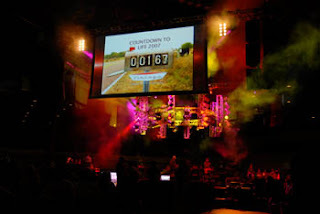 Last week, I was given the privilege of attending LIFE CONFERENCE 2007 in Orlando along with 36 of the 7,500 teens from across the United States. It was definitely the experience of a lifetime…but it was more than an experience. It was a time for growth, learning and discovering a deeper understanding of God. One is the depth of God’s love – His love for me, His love for the world, His love for His Son. Gaining a greater grip on this love brings a greater appreciation of our salvation, a stronger urging to please God in every aspect of my life and a more genuine yearning to share this love with others. The second theme revolved around God’s grace…something I don’t think we will ever really grasp on this side of eternity. This grace flows naturally from the previously mentioned love. It is a grace that is foreign to our human minds because it goes against the character of our being. We live our lives in the light of this grace, knowing that it is God who has purposed each step of our walk. While I didn’t find a fountain of youth, hanging with teenagers for 8 days definitely rejuvenated my spirit…and my Life Experience definitely made me feel young again – young in the sense that there was a fresh awareness of God’s presence in my life and a new appreciation for what I have yet to see and understand. I will never be able to completely convey in words all that God did in my life during this time, but then again I pray that my life conveys those things that words cannot.